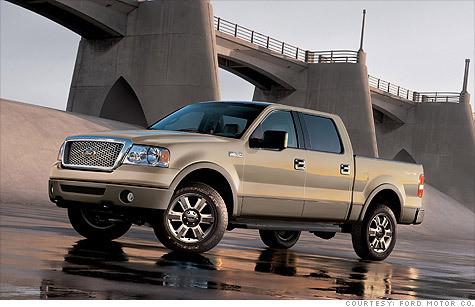 NEW YORK (CNNMoney.com) -- Ford Motor Co. is recalling almost 1.2 million full-sized pickups for a problem in which airbags can go off when not needed, expanding a much smaller recall it had instituted months earlier. Ford recalled 144,000 trucks over the problem in February but the National Highway Traffic Safety Administration said at the time it was continuing to investigate the issue and might demand that the automaker issue a much larger recall, which Ford is now doing. In a statement, Ford said it is issuing the larger recall "to reassure our customers of our safety commitment." The recall applies to 1.19 million trucks, mostly Ford F-150s built between 2003 and 2006 but also some 2006 model year Lincoln Mark LTs. The problem is caused by an improperly placed wire in the steering wheel, where the airbag is housed. Insulating material on the wire can rub off, causing a short circuit that can lead to warning lights and inadvertent deployment. Ford had claimed the problem did not represent a safety issue because, in these cases, the airbags go off moments after the truck is first started and before the driver has taken the vehicle out onto the road. A warning light indicating the airbag requires servicing usually lights up multiple times before the deployment occurs, Ford said at the time. In a letter sent to Ford (F, Fortune 500) in late January, federal safety regulators called the 269 then-reported incidents of unneeded airbag deployments in F-150 trucks the "most incidents ever recorded in any inadvertent airbag deployment investigation or recall in NHTSA history." The agency accused Ford of downplaying the rate of airbag deployments, adding that the rate of incidents was likely to increase over time. Beginning in January 2006, Ford altered the way the driver's airbags are installed to put a stop to the problem, according to the safety regulator's documents. Customers should seek service immediately if the truck's airbag warning light is illuminated, the automaker said in a statement. While Ford said it is not aware of any accidents related to the problem, one driver did jump out of a slowly moving vehicle after the airbag went off in the car, the automaker said.